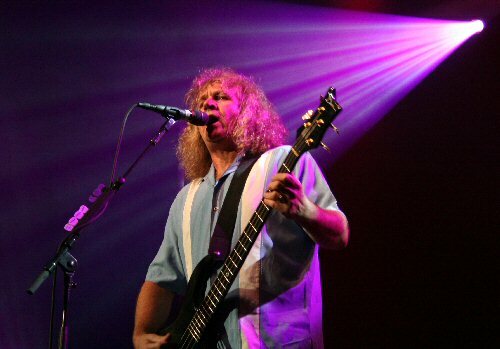 KANSAS, the American prog rock band from the heartland of the country, returned to New Jersey on March 06, 2007 for a show at the Bergen PAC in Englewood that celebrated the 30th Anniversary of their Point of Know Return album. 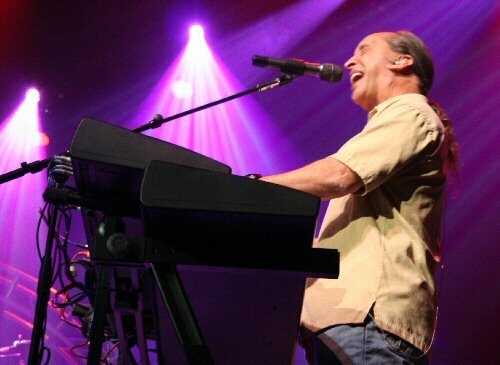 Kansas vocalist and keyboardist Steve Walsh on stage at the Bergen PAC! 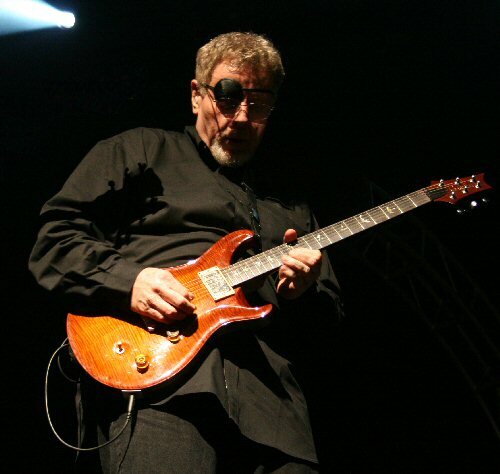 Over the years Kansas has been considered at times a spiritual band and one of their founding members and main lyricist, Kerry Livgren, had a conversion to born again Christianity before eventually leaving the group in the 1980's. When we spotted another well known spiritual leader in the crowd - television's Rabbi Shmuley Boteach, star of The Learning Channel's Shalom in the Home - we knew we wanted to interview him for Kweevak Radio to get his take on the show. "Well, you probably know that the main thing I do is hosting TLC's television show, Shalom In The Home, which is on Sunday Night at 7," Shmuley began when asked about his interest in the rock band Kansas. "It's a show where I go around the country helping to heal broken families." Kansas guitarist Rich Williams provided electric leads and acoustic accompaniment! "Now, that stems from my own broken childhood as it were. My parents divorced when I was just eight," the 41-year-old father of eight kids of his own continued. "And, the songs of Kansas, I remember them so well from my childhood, and not having had the happiest childhood, I'm very nostalgic about my childhood. Some of their hits - they are just indelibly a part of my childhood years, especially haunting, haunting melodies like 'Dust In The Wind'." "I remember even thinking about the words when I was just a boy in the 70's when those hits first came out and I remember thinking about the power of lyrics that somehow describe the human condition," Shmuley said in reverence to the rock music that helped form the foundation of his character. "That we were dust, and because our lives were fleeting we therefore had to do something valuable with our own life." "It's actually very Biblical," the Rabbi continued about the concept of Kansas' best known song. "I don't know if the band intended it to be Biblical, but you know the very famous expression used by Abraham in his conversation with God, 'I am dust and ashes', and of course God creates Adam by forming together dust of the Earth and then breathing into that dust the breath of life. To be dust in the wind is to be very Biblical, it's a universal sentiment." Fans wanting to hear more of the interview with Rabbi Shmuley are encouraged to the download the MP3 which contains more about the concert, the power of rock music, and Shmuley's take on the celebrity life. Bass player and vocalist Billy Greer was the band's front man and emcee! Of course, the song Rabbi Shmuley referenced, "Dust In The Wind", comes from Point of Know Return and this current Kansas tour is a 30th Anniversary celebration of that multi-platinum release. The songs on this progressive concept album may be even more appropriate for today's listening audience then when it was released back in 1977 - a world that existed without the Internet, Cable TV, the personal computer revolution, and a roll back of civil liberties in America. The unifying theme of the record warns of the dangers of absolute power and the malevolent use of technological advancements. Thus, we see the ship on the album cover that is just about to go over the edge. Unfortunately, if we're not careful, in today's world we just might not be that far from the point of no return. Both the title track and "Dust" were performance highlights during the concert in Englewood. On this night a few more songs from this record were performed along with additional obligatory Kansas hits and one rock cover that was right at home in the state of New Jersey. At one point - bass player, vocalist and front man Billy Greer commented that if "we got paid by the note we'd really make a lotta cheese" - and that's true. Kansas exploded with musical riffs as soon as they took the stage, firing off intricate songs and musical passages that featured stellar performances from the five featured players. Powerhouse vocalist and keyboardist Steve Walsh delivered powerful renditions of the band's staples while Rich Williams provided a strong guitar with many tasty licks and trade-offs with enthusiastic violinist and singer David Ragsdale. Drummer Phil Ehart was the powerful foundation and back-beat for the group's epic offerings and his playing was present and steady without being overpowering. Rich Williams, David Ragsdale and Billy Greer played a lot of notes! A surprise song was played during the encore when the band kicked into Bruce Springsteen's "The Rising" which featured Greer on lead vocals with Walsh covering the back-ups and parts covered by Nils Lofgren when the E Street Band performs this one live. Ragsdale fit right in on violin with the tasty melodic fill Soozie Tyrell played on the original. The New Jersey crowed seemed to enjoy the take, rising to their feet, with shouts of "Bruuuuuce" thrown in for good measure. Other highlights of the evening were "The Wall", "Hold On", "Miracles Out of Nowhere", "Carry on Wayward Son", and "Song For America". The original band was formed in 1974 and achieved their greatest commercial success in the 70's and 80's. However, the power, passion and precision displayed by the tight-knit, five-piece progressive outfit on this night proved that in 2007 the state of Kansas is still thriving and we look forward to their next return to the area! ABOUT KANSAS: They have been a band for four decades and they have been touring continuously for 20 years. KANSAS has been known to fill entire stadiums throughout North America, Europe, and Japan because of the exceptional live shows they play and hits such as "Dust in the Wind", "Carry On Wayward Son," "The Wall," and "Point of Know Return." 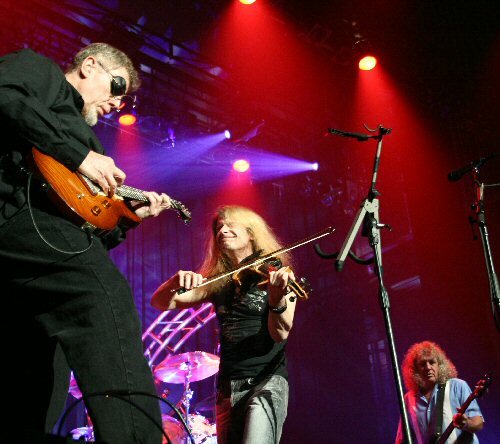 The band has produced eight gold albums, three sextuple-platinum albums (Leftoverture, Point of Know Return, Best of), and one platinum live album (Two for the Show). In 2000, KANSAS returned to the studio with all six members of the original line-up for the first time in 20 years to produce Somewhere to Elsewhere. 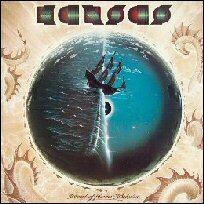 Four years later, Sony Music released a KANSAS boxed set, Sail On, featuring unique cuts as well as vintage video footage on an included DVD. A look at the stage set-up for the Kansas 2007 tour.